“Critics have long complained that IDEM is understaffed, underfunded and doesn’t do enough to protect the environment.” IDEM, is an “18-year-old state agency with a $161 million budget and more than 900 employees. (Associated Press, ‘Activists wonder where Daniels will lead state’s environment’ Nov. 22, 2004). 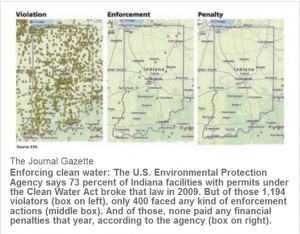 “The state issued more than $2 million in environmental fines in northeast Indiana from 2004 through 2006, but not all the money was actually collected. Indiana Department of Environmental Management records showed fines in northeast Indiana ranging from $300 to $382,725 during that period, according to The Journal Gazette review of the data published [December 2007] (Indy Star, “IDEM fails to collect fines in full” Dec. 10, 2007). violators, only one-third faced any kind of sanctions. Coal's Contribution to Water Probs.